READING, PA - Sometimes hockey is about more than wins and losses. It's about giving back to the game the players love, inspiring youth to achieve their on-ice best, and role-modeling leadership and character. 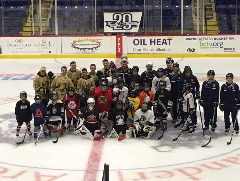 As a prelude to the third annual Royal Cup face-off against Navy, ARMY WEST POINT cadets skated with Reading-area youth hockey players in a 90-minute clinic. Male and female skaters ranged in ability and age, from those in their first season on ice to early teens. Players worked on skating skills, puck handling, goaltending, and scoring. West Point team captain Zach Cohen (2017) was joined by fellow Black Knights including Wyomissing-Reading native Drew Lysakowski (2017), Jake Brown (2017), Jake Stachurski (2020), Caleb Septer (2020), and Jeston Rademaker (2020). Coaches and members of the Penn State Berks Ice Lions (ACHA DII) also skated with clinic attendees. ARMY WEST POINT defeated the Ice Lions 7-2 in late October.